9 December 2014 | In the past years airlines around the world have been busy installing seats in Business Class that can be turned into fully flat beds, making ‘full flat’ the industry standard. In an effort to further differentiate their premium product, airlines are increasingly coming up with creative ways to improve the ‘softer’ service elements of the inflight experience. Examples include Virgin Atlantic’s Snooze Zone, Delta’s partnership with Westin and Aer Lingus’ new Business Class which offers passengers a well thought-out combination of product and service innovations. In an effort to provide frequent flyers in Business Class with the maximum amount of sleep, Qantas is introducing Business Class seats on its A330s that let passengers recline from the moment they board until touchdown at their destination. The innovation, for which Qantas is awaiting regulatory approval, could let passengers get more than seven hours of shuteye on an Australia to Southeast Asia trip. As aircraft seats are traditionally locked upright during take-off and landing, when most accidents happen, the innovation would allow Qantas to offer the world’s first seats that let passengers recline in their seat from take-off through to landing. Key to the break-through product’s safety is an over-the-shoulder belt — much like a car seatbelt — that connects with the usual around-the-waist belt to provide extra restraint during takeoff and landing. 23 May 2013 | In today’s world of non-stop information and endless social network notifications, it’s hard to find the time to concentrate on just one story, never mind finishing a full-length novel. The Netherlands’ VertragingsApp has already encouraged train passengers to discover short story authors based on their delay time, and now a new project has created a range of fiction titles for customers of Australia’s Qantas airline, selected to correspond with flight times. Titled ‘A Story For Every Journey’, the project is a collaboration with Sydney-based ad agency Droga5. The campaign used statistics from publishing house Hachette to discern that the average reader can finish around 200 to 300 words – or one page – each minute. Taking into account time set aside for meals and naps, customers should be able to read the books in exactly the time it takes to set off and land. The range was selected while keeping in mind the airline’s Platinum Flyers demographic – mostly male customers – meaning they suitably span the thriller, crime and nonfiction genres. Penned by notable Australian authors and stylishly designed by UK-based agency Paul Belford, the airline is hoping to attract an upmarket audience by offering the novels on its extended flights. Video of the campaign here. Given that airplanes are one of the few places where use of electronic devices is actually discouraged, the books could take off with those who fly regularly. Are there other ways to tailor literature to different reading environments to help consumers rediscover the novel? 12 November 2012 | Hot on the heels of the announcement that Qantas has started the rollout of its new Q-Streaming wireless inflight entertainment service comes an interesting look behind the scenes. Qantas’ Q-Streaming service will see every seat on Qantas’ B767 aircrafts get an iPad that provides passengers with access to more than 200 hours of content, streamed from an onboard server. Passengers who own an iPad, laptop or smartphone will also be able to view the same content through a separate application, but it is unclear when this feature will be introduced. Qantas has also indicated that it is looking at ways to evolve the Panasonic-based technology platform further. 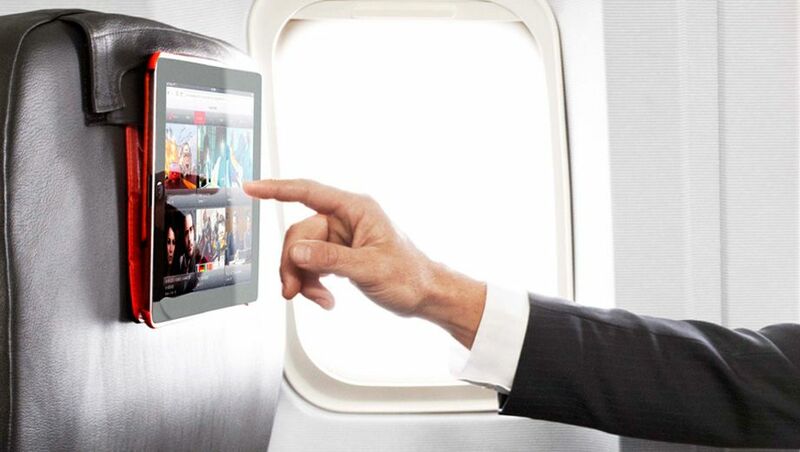 According to the airline’s Domestic CEO Lyell Strambi, “This could include the addition of internet access, live television and the ability to order food, drinks and duty- free goods via the iPad.” More on the Qantas’ Q-Stream system in this report by Australian Business Traveller. In order to keep all 256 iPads onboard the B767 fully charged for return flights, multiple flights during the day, as well as to simplifly logistics, Qantas has partnered with Australian IT equipment designer and manufacturer PC Locs that will see the company deliver a fleet of customised galley carts to support the airline’s new IFE service. PC Locs will supply Qantas with iPad charging carts, which essentially are normal galley trolleys that have been re-kitted to store, transport, sync and charge up the devices onboard. The iPad carts will be deployed on the airline’s Boeing 767 fleet, which operates on routes across Australia and between Australia and Honolulu, Hawaii. 7 November 2012 | Airlines around the world are responding to the explosion in passenger use of smartphones, notebooks, tablets and e-readers – plus the increasing expectation that these devices can be connected inflight – by incorporating power sockets and USB ports in aircraft seats (including Economy) and introducing onboard Wi-Fi. Furthermore, several carriers have also introduced wireless inflight entertainment (IFE) systems. These new developments result in the emergence of an alternative eco-system to today’s traditional seatback-based IFE systems, which sees tech-savvy passengers bring their own digital devices (or airlines providing tablets), and connect them to an onboard server to stream content from it. The lastest initiative in this field comes from Australian airline Qantas, which is the first airline in the world provide all passengers on its refurbished fleet of 16 Boeing 767s with free use of an iPad during the flight, which can be connected to a wireless IFE system. Following a trial earlier this year, Qantas’ so-called ‘Qstreaming’ service, which is based on Panasonic’s eXW system, gives passengers access to more than 200 hours of on-demand content. More on Qantas’ Q Stream system in this report from Australian Business Traveller. Australian Business Traveller also reports that the new seats on Qantas’ refurbished 767s have been fitted with a special iPad holder built into the upholstery. Each of the Qantas-issued iPads, which all 254 passengers can find in the backseat pocket, comes with a flipcase which folds back and slides into a slot on the headrest, so passengers can continue to watch their movie or TV show ‘hands-free’ during meals. Passengers who carry their own tablet should also be able to slot in their own devices. 21 October 2010 | As the number of airlines that have rolled out applications (apps) for mobile devices such as the iPhone grows (around 30 at last count), the types of apps are becoming more specific. Qantas has just released a dedicated app for the seven million members of its ‘Frequent Flyer’ loyalty program. Standard elements of the carrier’s new iPhone app include access to current point balance and personal profile, features which are also offered by several ‘general’ apps of other airlines. The main focus of the Qantas Frequent Flyer app, however, is to show members the wide range of earn and burn options of the loyalty program. In the past years, Qantas has been turning its frequent flyer program into one with a broader appeal, and in 2009 teamed up with Australia’s largest retailer Woolworths to combine their loyalty programs. Qantas’ objective is to turn Frequent Flyer into Australia’s dominant loyalty program, much like Aeroplan in Canada. Aeroplan, which manages Air Canada’s loyalty program, was spun off from the airline via an IPO in 2005, and today Aeroplan’s market value is more than three times that of Air Canada. 26 July 2010 | Qantas has unveiled what it calls a ‘next generation’ check-in experience. The new ground service provides premium Qantas passengers on domestic flights with a smart card-based check-in, as well as electronic bags tags that keeps track of their luggage. The new check-in is designed by renowned designer Marc Newson who earlier created Qantas’ A380 cabin and its first class lounges.